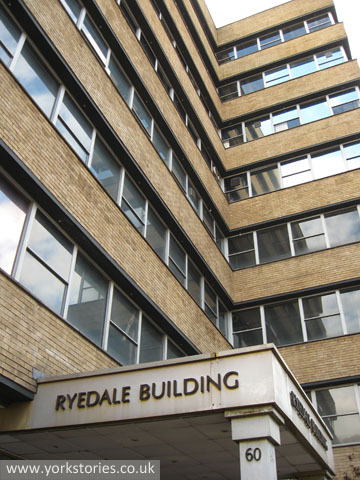 Ryedale House, as it is known, though its entrance displays the less cosy-sounding name: Ryedale Building. Ryedale House, Hilary House, there’s nothing ‘house’-like about them really, is there. They’re massive office blocks. It was still fashionable to name office buildings in this way when ‘Roman House’ was built in the gloomy canyon otherwise known as Rougier St. Maybe it still is. An important 21st century office building is soon to rise up on the Hungate development site — the obvious alliterative appeal may mean we have a ‘Hiscox House’. But back to the 70s, on Piccadilly. Ryedale House, built 1972, pictured in 2012. With those crappy planters buildings like this always have, supposed to soften or enhance the landscape in some way. The usual half-hearted dull shrubbery, with weeds, and usually filled with litter and fag ends. 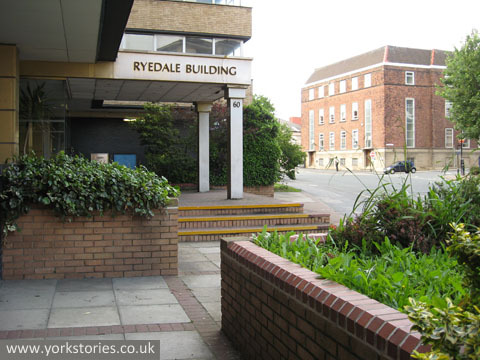 Available information suggests that Ryedale House was built for the North Yorkshire Health Authority, originally. It appears to be mainly or completely empty now, and is on the same list as Hilary House, office space to rent. About 10 years ago the local press referred to it as ‘doomed’ — the ambitious plans for the ‘Castle Quarter’ would have seen it demolished. But they’ve been abandoned, and the only development on the cards is a smaller scale planning application for the adjacent site. Is it still doomed? I’ve seen some suggestions that it could be turned into residential accommodation. It would have impressive views presumably, as it’s so massively tall. I’m a big fan of the Foss, the ‘people’s river’. Not a touristy place. Good. We’ve got to have some places to go to get a bit of peace and quiet. 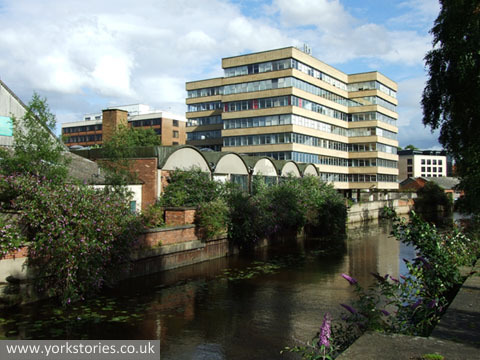 Here’s a view of Ryedale House and other ‘real York’ buildings, and weeds, last March. I found this view aesthetically pleasing. Maybe I’m weird. 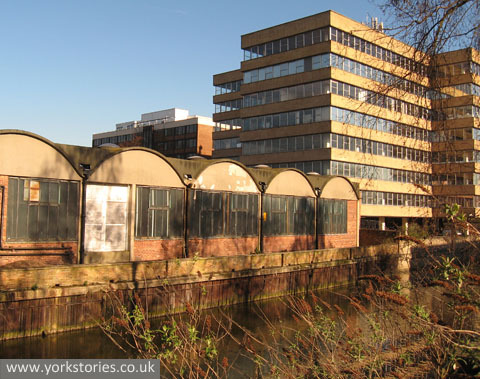 And another view of that eyesore 1970s building, in the summer of 2007, again from the other side of the Foss. Not that bad really is it. Would rather look at this than the other more recent additions to Piccadilly, facing it. Hard to imagine these huge office blocks of the 60s/70s being reoccupied now and properly useful. Looking at them reminds me of the old film of the Terry’s and Rowntree’s factory buildings, in that those large industrial premises belong to a different age, and can only be reused if gutted and divided into smaller units. If you’re massive and successful now you build your own premises, to suit the 21st century. As Hiscox will be doing soon, on the Hungate site. Like the 1960s built Hilary House, the 1970s Ryedale Building is on the City of York Office Stock Availability reports with a Grade C rating. Ryedale House is included on the ‘List of detracting buildings’ in the York Central Historic Core Conservation Area Appraisal Supporting Information (see section C of the PDF). Hilary House and Stonebow House are also on the list. I don’t suppose if anyone knows whether or not the building is for sale? If they do could they send an e-mail with details to steamtacular@googlemail.com ? Is the building for sale ?